We all prefer to be happy in our jobs. Nobody likes disgruntled or disruptive employees. The best way to avoid problems is having a system relative to employee conduct. 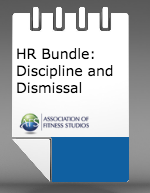 Download this HR bundle and get yourself organized and on the right track! Accidents do happen and when they do, how you respond is often as important as identifying the cause. This one-page form delivers the critical information you need to collect during stressful circumstances. From time to time, employees need to be disciplined and how you handle these situations can be the difference between legal action against you or not. This short document provides the template to confirm that the issue has been addressed with the employee and that the employee acknowledges the issue(s), the remedies, and the ramifications if the behavior continues. Understanding how often – and why - a client cancels is the key step in retaining that client. Perhaps it was “nothing,” but perhaps it was a signal of displeasure. This one-page form will help you stay on top of the situation. Whenever an employee leaves, there are legal and governmental implications. It is essential that you secure an exit document that details the departure. This form is for voluntary resignation.